A Nunavut elder and former MLA with kidney failure says he feels like he’s being held hostage in Winnipeg as he waits to find out if he’s eligible for home dialysis — and if so, which government will pay for it. Peter Kattuk, 68, appears to be caught in the middle of a funding clash over home dialysis services between the Manitoba and Nunavut governments. “I will not live here. I don’t want to live here,” Kattuk told CBC from his temporary residence at the Kivalliq Inuit Centre, a boarding home for Inuit patients in Winnipeg. At the centre of the clash is the lack of a funding agreement between the two jurisdictions on providing home dialysis. While there is a reciprocal agreement for Nunavut patients receiving in-hospital services in Manitoba, there is no agreement between the two jurisdictions when it comes to home dialysis. That’s resulted in months of uncertainty for Kattuk. He has been living nearly 1,400 kilometres away from his home in Sanikiluaq, Nunavut, since early January, when he was medevaced to Winnipeg due to kidney failure. 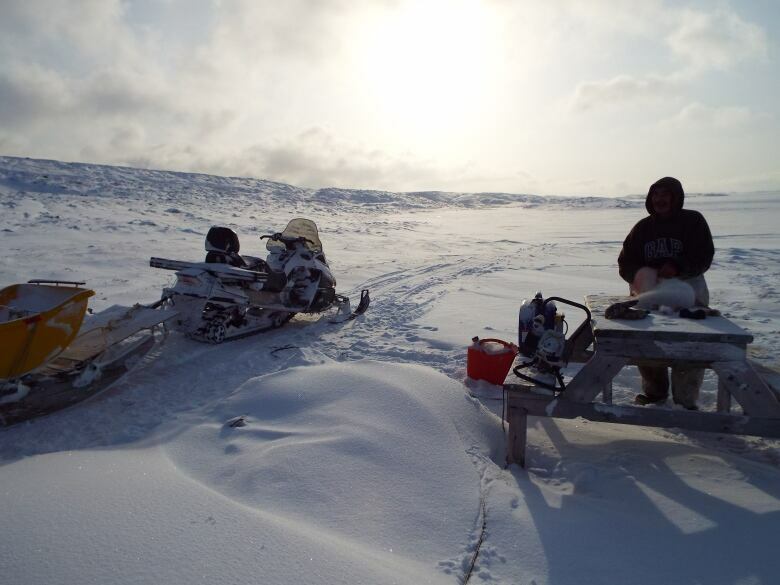 With no option for in-hospital dialysis in Nunavut, residents in Kattuk’s community must either move to Winnipeg or get set up and trained for dialysis that can be done at home (referred to as home peritoneal dialysis). That option was presented to Kattuk when he first arrived in Winnipeg. However, for reasons that remain unclear, a Feb. 22 appointment to assess whether he qualifies for the home dialysis was abruptly cancelled and has not been rescheduled. Kattuk says he knows two other people from his community who were able to go home, after being set up for peritoneal dialysis. That treatment allows people to do their own blood-filtering procedure at home. Now, he says he’s been told he must move to Winnipeg permanently and get a Manitoba health card to continue receiving treatment. “It looks like they are holding me as hostage, like a hostage. They won’t let me train [for dialysis] or get assessment from them,” he said. While almost 150 patients were assessed and trained for home dialysis in Manitoba last year at no cost, it appears Kattuk’s status as a non-resident of the province has placed him in limbo. The onus for paying for Nunavut patients’ dialysis falls to the Nunavut government, said Amie Lesyk, a spokesperson for the Manitoba Renal Program, which is responsible for providing care for people with chronic kidney disease and is funded by the Winnipeg Regional Health Authority. It costs about $35,000 for the first year of home dialysis, but the cost increases significantly when the patient is outside Manitoba because of shipping, she said. Lesyk could not comment on Kattuk’s case, but said there has been an increase in demand for home dialysis for patients originating from Nunavut, who want to return home. She said fewer than five Nunavut patients who received care in Manitoba have previously accessed home dialysis, and their plans were made between the two jurisdictions on a “case-by-case” basis. “To ensure home peritoneal dialysis patients residing in Nunavut receive uninterrupted care and continuous access to life-sustaining dialysis treatments, it’s imperative for Manitoba Renal Program, [Manitoba Health], and the Government of Nunavut to have a clear agreement on service provision and funding for a patient returning to Nunavut on home dialysis,” she said in an email statement. CBC News reached out to the government of Nunavut for comment on April 3. So far, no comment has been received. As a residential school survivor, Kattuk says he doesn’t want to spend any more time away from his community. He devoted decades of his life to serving in public office, first as Sanikiluaq’s mayor in the 1990s, and then as the representative for Hudson Bay in Nunavut’s legislature from 1999 to 2008. He says he never imagined he would have to spend his last days away from the community he has spent his life serving. “I’ve been away from home for so many years. I was sent out to residential school, I was separated from my parents. Now I am an elder … and I still have to be separated from my family and from my community,” he said. About 850 residents live in Sanikiluaq, which is located in the Belcher Islands in the southeastern part of Hudson Bay, about 150 kilometres off the coast of Quebec. Now he spends his days at the Inuit Centre with his partner, Annie Iqaluq, and gets dialysis three times a week at Winnipeg’s Health Sciences Centre. When they have enough money, they go to Polo Park shopping centre to eat dinner. “It’s very hard for me right now, but I’ll fight for it, as much as I can,” he said. Rachel Dutton is the executive director of the Manitoba Inuit Association, which advocates for Inuit living in Manitoba. She says accessing health care is one of the main reasons Inuit end up in Winnipeg. According to Statistics Canada, there are just under 600 Inuit living in Manitoba. Dutton says living far away from their home community can affect the health outcomes of patients coming here. “[There’s] no access to being out on the land, which is what they know — no access to traditional food, perhaps not being fluent in English, and therefore encountering a lot of barriers within the services they are provided,” she said. As of Tuesday afternoon, Kattuk said he had received no further communication from any health officials regarding the status of his assessment for home dialysis.